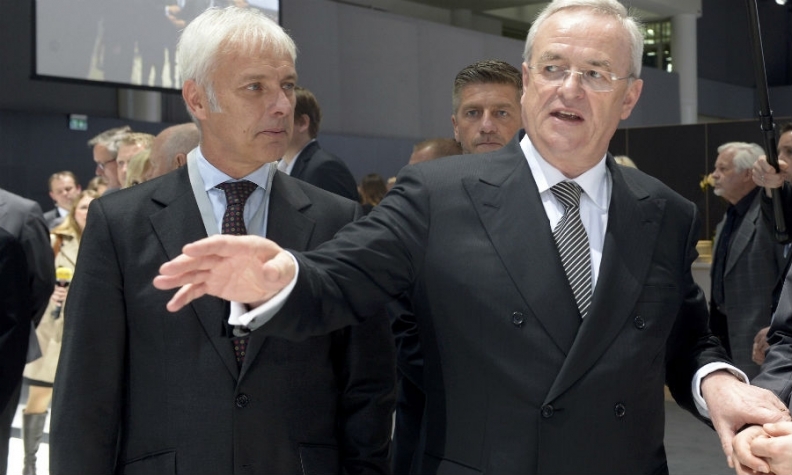 Winterkorn, right, briefed VW's executive board including his successor Mueller, left, about the U.S. 'defeat' device issue, Bild am Sonntag said. BERLIN (Reuters) -- Volkswagen Group's current chairman, Hans Dieter Poetsch, and CEO, Matthias Mueller, were alerted by the company's former CEO Martin Winterkorn to the use of illicit emissions-control software in the United States two weeks before the carmaker disclosed the scale of its manipulations, a German newspaper said. Winterkorn, who resigned within a week of the emissions scandal becoming public on Sept. 18, briefed VW's executive board on Sept. 8 that the carmaker had admitted the use of "defeat devices" to U.S. authorities, Bild am Sonntag reported, without citing the source of the information. Participants in the Sept. 8 meeting included then-finance chief Poetsch and then-CEO of Porsche, Mueller, according to the paper. They have since taken the positions of VW chairman and chief executive, respectively. Former CFO Poetsch has been criticized by some investors and analysts for failing to inform VW's shareholders of the looming problem, with some of them demanding that VW select an independent chairman if it wants to overcome the crisis. "Volkswagen is convinced it fully complied with the requirements set out in the securities law," a VW spokesman said on Saturday. "Volkswagen categorically declines comment on contents of management board meetings." VW's own acknowledgement of the manipulations on Sept. 20 subsequently erased billions of euros from the company's market value, forced Winterkorn's resignation and sparked investigations and lawsuits across the world. The carmaker defended its actions on March 2, saying it had not failed in its duties because it had no idea until the U.S. Environmental Protection Agency released its statement on Sept. 18 how expensive the affair could become. The actions by VW's management were driven by an "interest in secrecy" as the carmaker was hoping to find a "solution" with U.S. authorities without incurring major fines, Sueddeutsche Zeitung reported in an advance release of Monday's edition, citing a VW position paper drawn up to fend off damage claims from shareholders. A VW spokesman declined comment on Sunday. Germany-based law firm TILP, representing some shareholders' lawsuits against VW, on Sunday dismissed VW's interpretation of disclosure rules as "misleading and wrong" and accused the carmaker of trying to blame its stock plunge on the EPA's Sept. 18 notice of violation. VW has pledged to publish results of an investigation into the scandal in the second half of April. The inquiry is led by U.S. law firm Jones Day.